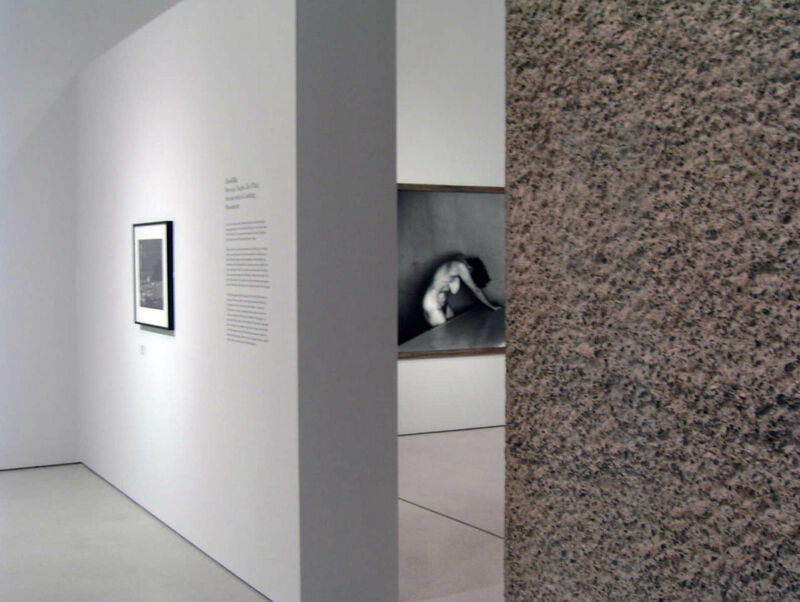 This major exhibition of European photography of the 20th century was hung chronologically over two floors. Smaller works from the early half of the century were arranged in a series of similarly scaled rooms, painted in a range of colours loosely based on the location of the photograph and the imagined colour of the sky at the time. The lower galleries were treated as a single space, uniformly painted light grey and divided by abstract forms including a glass pavilion for the work of Wolfgang Tillmans. A public exhibition curated by Pierluigi Nicolin for the Salone Internazionale del Mobile in Milan. The practice was one of eight contemporary architects invited to make an installation in response to eight classic modern houses of the 20th century. Tony Fretton Architects made an installation in response to the Smithson’s Upper Lawn Pavilion. This was an extremely large show extending across two halves of the fourth floor of Tate Modern. 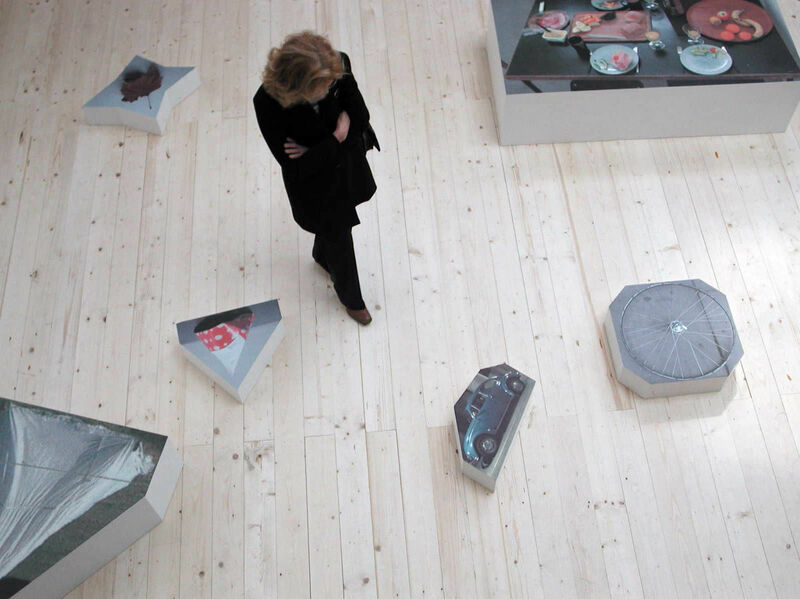 In designing the installation we thought of the visitor as a tourist in an unfamiliar city. In the concourse we interspersed seating and vitrines which contained original books and catalogues on the work of the exhibiting photographers. We worked with the graphic designer Melanie Mues adorning the walls with a forest of directions under which were written the names of exhibiting artists. In this treatment of the concourse we achieved a most vivid exposition of its possibilities as a space for arrival that we had so far not seen. In a great chamber crowded by classical columns, crowned with a dark void suggesting the nocturnal sky and enclosed by 6,5 metre high masonry walls, we have made a place whose character shifts from the urban to the domestic. The place and the objects within at once recalls a small, monumental piazza, and a salone grande, redolent of Venetian palazzi. Different interpretations of where one is or what things are––or how one might be (public, private)––depend on one’s point of arrival. From the main entrance, one happens upon a street scene, festooned with lights. 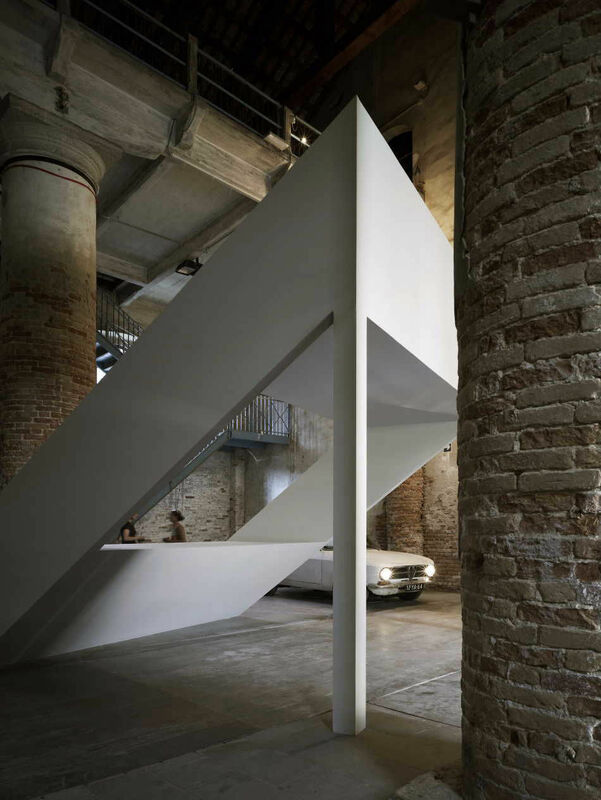 A car, its interior an empty lounge waiting for guests, is parked in front of a loggia or monumental staircase. Caught in the car’s headlights, a great pile stands in an opposite corner, a ghost of a building as though viewed from a distance.The place is at first very much like a piazza, though the presence of objects of inconsistent scale lends it an ambiguous character that is reinforced as one moves through it. The ghost reverts to being a rack of shelves, and the piazza briefly assumes the guise of a chapel, the loggia a baldacchino. A diminutive font5 is caught in a beam of light, its tiny pool casting rippling light high onto the walls, reminiscent of the play of the lagoon. Tall, empty stretchers stacked on top of each other in another corner sketch a succession of illusory interiors, an trompe l’œil enfilade of unmade pictures.6 A pale object, again, like a stack of shelves, stands next to them: an abandoned piece of furniture, an overgrown doll’s house that one can fill with one’s dreams.An image of swaying branches of trees at dusk shimmers upon the wall like a window onto another place, a world beyond. The space is now a room, a private interior. A desk sitting in a pool of its own light is an intimate refuge turned to the wall.8 A secretaire, or building, stands by.9 Next to the desk, another opening, another place and the image of another in the sylvan glow: one’s reflection.10 One sees an interior receding behind one’s own image. Then, one turns, naturally, outward, past the furniture, to see the city, waiting. One looks back through the loggia to all the figures one has seen, and returns to the piazza, the city, its lights, its movement, its fantasy. The car’s doors are open. 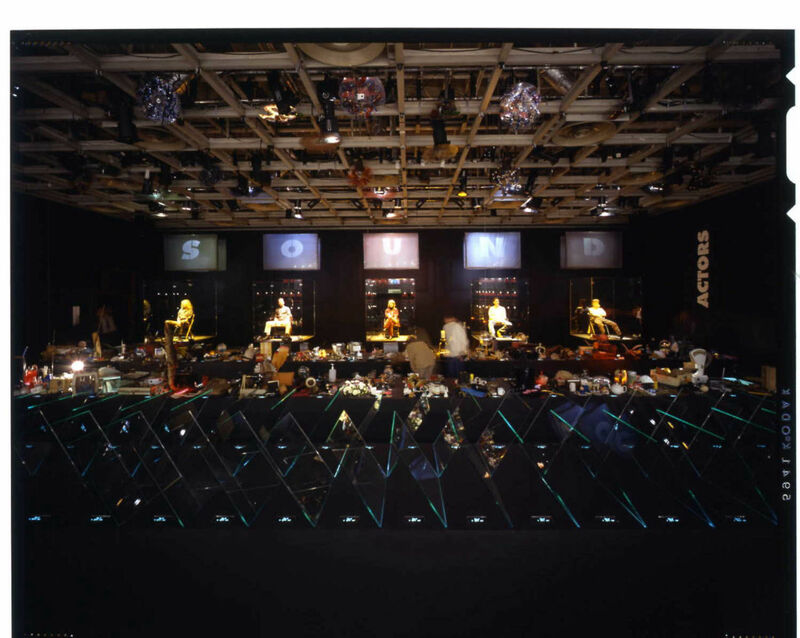 As designers of the Hayward’s Spellbound exhibition it was our role to produce a scheme to combine a range of exhibits in a variety of media including painting, sculpture, installation, film and video. Featured artists included Douglas Gordon, Eduardo Paolozzi, Steve McQueen, Paula Rego, Ridley Scott, Terry Gilliam, Boyd Webb, Fiona Banner, Peter Greenaway, Damien Hirst, Tim Head, Derek Boshier, Bruce McLean, Sam Taylor-Wood. 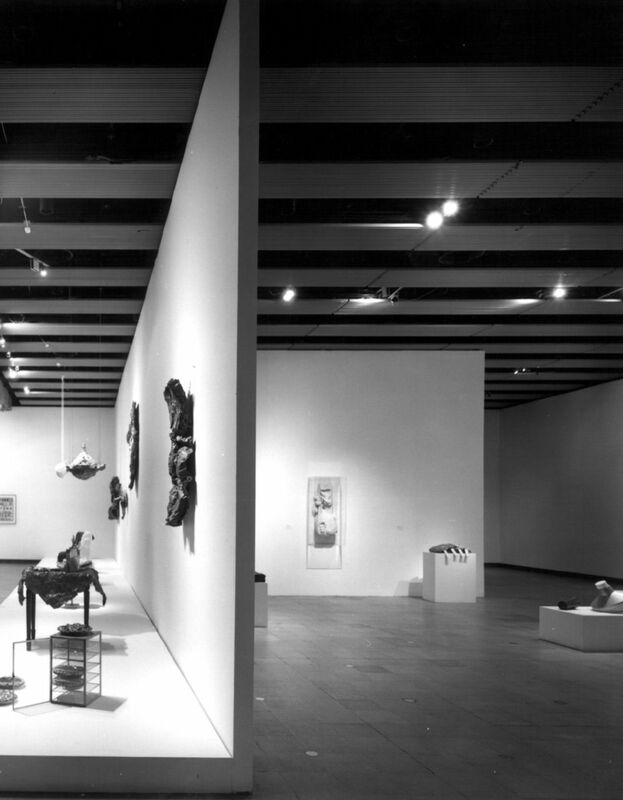 In our design of the Hayward’s Claes Oldenberg retrospective we manipulated the different spaces of the gallery to reflect the context and influences of each stage of the artist’s career. For example, the tall room of the first gallery gave a sense of the scale of the street grid of Manhattan - where the artist found inspiration in the early years - and provided a backdrop for the early large scale soft sculptures that he produced there. 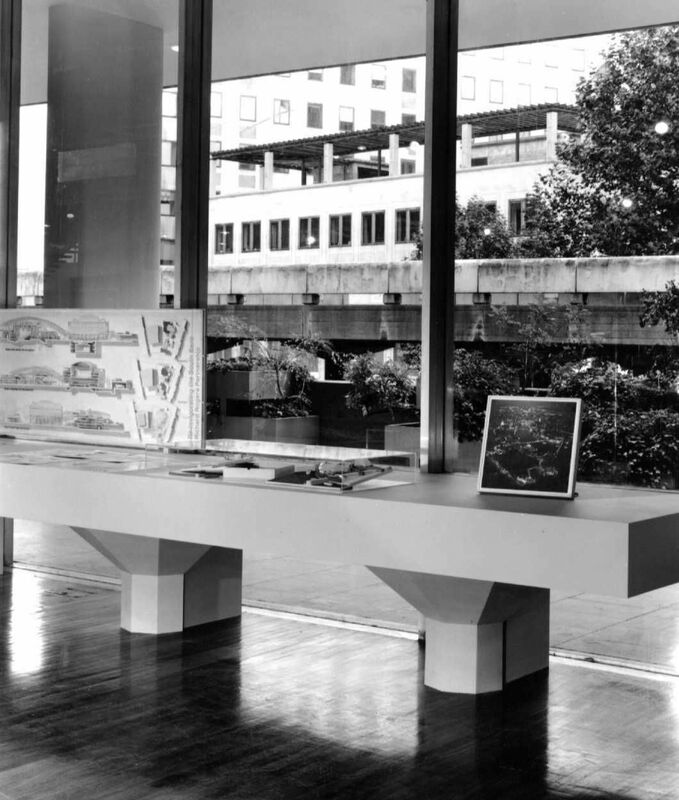 In 1998 we were appointed by the Royal Festival Hall to design an exhibition of submitted architectural schemes for the renovation of the public spaces of the South Bank. 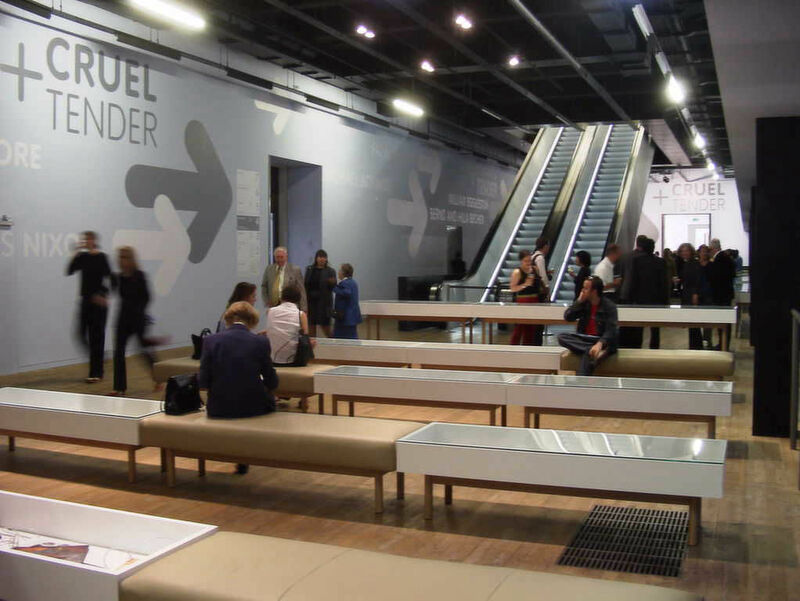 Our design echoed the egalitarian modernist quality of the Festival Hall foyer, where the exhibition would take place, presenting each competing scheme without hierarchy. 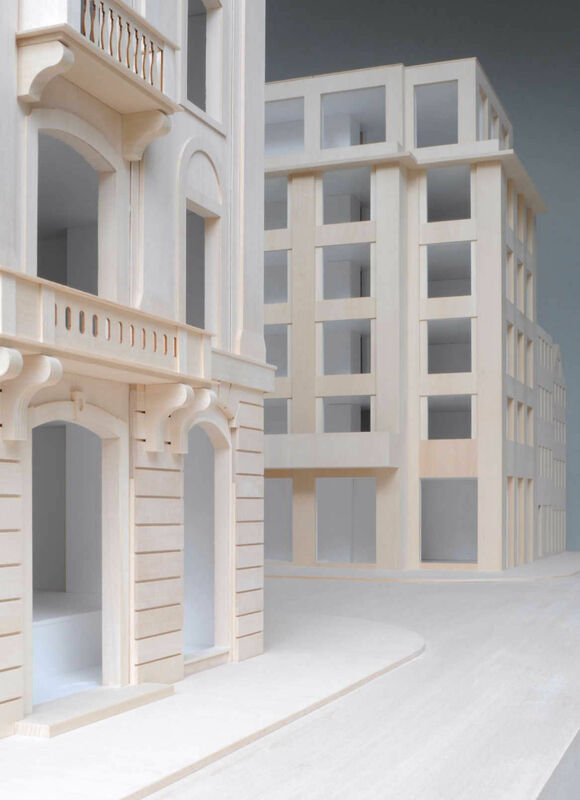 We replicated the most recognisable buildings on the South Bank in simplified form as display stands for the exhibits and placed them in the same relationship to each other as the originals. The winning scheme by Richard Rogers was placed closest to reality, at the window looking out to the Southbank itself.